Videos: Alexander Rybak’s concert in Skellefteå, Sweden, 17.02.2013. Skellefteå. It was just like a fairytale for the string students at Skellefteå music school. A whole weekend with the charming and skilled violinist Alexander Rybak. “He has taught us a lot”, says Linnea Lindström. Elsa Lundell from Bergsbyn has only played for around half a year. But she has dreamt about playing the violin since she was three. 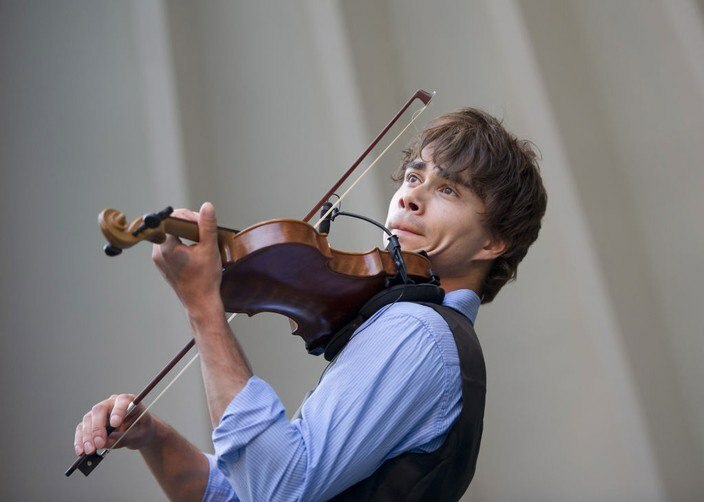 Article and video about Alexander Rybak’s concert in Skellefteå, Sweden. Recording and subs by Ulli Cologne. Translation by Hilde M.
Inspires young talent. The Eurovision winner was in the Melodifestival city this weekend. The music school in Skellefteå turns 50 and has invited Alexander Rybak. Published in the paper issue of “Norran”. 16.02.2013. Found by Ulli Cologne. Translated by Ingegerd Claesson. A Eurovision winner and his string project. SKELLEFTÅ: At the same time the Swedish artists had their general rehearsal of Melodifestivalen was the Norwegian Eurovision winner in Skellefteå. But this time Alexander Rybak isn’t here for the rose coloured party. He has his own project. In 2009 he won ESC in Moscow with the song ”Fairytale”.It had a big impact in Norway. But that he became a mega celebrity in the whole of Europe wasn’t the most important thing. It doesn’t care very much about it. – In Norway there were 60 percent more who started to play the violin after I had won. What gives me most here(he points at his heart) isn’t what happens in the big concert halls, but what happens locally, says Rybak. He came from nowhere in 2009 and took Europe by storm when his super hit “Fairytale” won the Eurovision Song Contest. Now, Alexander Rybak, tells in an exclusive interview for Poplight, his opinion of what is good music and about his plans for the future. – My dream for the future is to settle down and just write songs, Alexander Rybak says. Alexander Rybak is currently in Skellefteå for the weekend to give two concerts together with string students from music schools in Skellefteå, Umeå and Lycksele. The music school in Skellefteå has arranged this in connection with its 50 years anniversary. Poplight met the Norwegian violinist, and artist, after a practicing session with the students. The article was published in the paper-issue of Mora Tidning 4.8.2012. 2 Concert-videos, published by MoraLokalTV are added to the posting after the article! Vattnäs : The last event of the summer took place in Vattnäs concert barn during the weekend when Alexander Rybak performed with around twenty youngsters. This fall there will be new projects in the barn. On Saturday youngsters from among other places: Sollerön, Älvdalen and Oslo, who are on the way to become professional musicians, performed with Alexander Rybak in Vattnäs concert barn. Alexander and Elisabeth Andreassen in the Swedish TV-show “Så Skal Det Låta”. Video with the full show and a YT-playlist of Alexander’s performances. All video recording by Venche M. Playlist by Tessa La. Upload by Venche M. English translation by Ingegerd C., Hildebjorg H., Mary-Ann H. and Tessa La. Russian translation by Zhanna Sergueeva. Slovak translation by Danka Čolláková. Subs by Julia B. Three musicians from Lycksele have been invited to play alongside Alexander Rybak, the Norwegian winner of the Eurovision Song Contest from 2 years ago, at a course in Mo i Rana. The invitation was initially received by Siw Burman, a music teacher and national folk musician from Lycksele. In October, Siw will be travelling together with two young violinists, and it won’t be the first time they’ve collaborated with musicians from different parts of the world. The question that stands is: is it Siw or Alexander who will have the most to learn from this experience? P4-Morning also states that they wonder what the whole “Rybak-effect” is about. For the source, click here. Found and English translation by Mary Ann Hansson. Recording and subtitles by Yannis Pap. Translation of the accompanying article by Marianne Saietz. Russian by Sonya Luzina. In this video you can watch all Alexander’s performances in the concert. With visual material by Ingegerd Claesson, Martyna Agnieszka Jasinska and the Youtube channel “mkh1188“, in conjunction with the professional audio recording of the Swedish Radio P2. Video editing by Yannis Papadopoulos. His fingers are used to dance over the violin strings with wonderful results, but how fast our Norwegian singer favourite can move his feet, is about to be documented during today’s dance lesson with Alexander Rybak. Going to the room where the singer exercises his abilities with his partner Malin Johansson, we pass some charming obstacles like a freshly showered Andreas Weise and Björn Ranelid eating lunch. He greets us with at least five “hej”. But today we are Team Alexander and hurry from his contestants. TRANSLATORS NOTE: DUE TO LAZINESS AND FATIGUE, I DID NOT TRANSLATE ALL OF THE SWEDISH TEXTS. I TRIED TO TRANSLATE THE MOST IMPORTANT PARTS.I APOLOGIZE!